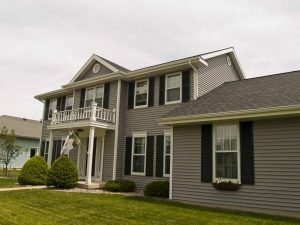 Mastic Quest double four inch vinyl siding in Harbor Grey color with White corners. Mastic aluminum soffit, fascia and gutters. Vinyl louvered shutters in Black color. We used long length siding to reduce to number of seems for this Madison Siding project.